Dina Kowal Creative: Paper Door Part 2! Just wanted to share a couple more projects I made using the Paper Door kit I shared about yesterday! 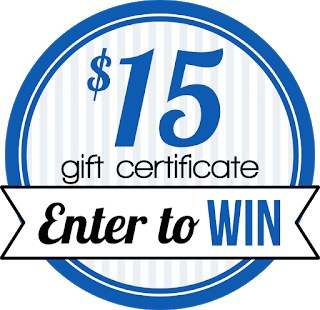 Keep reading for another chance to win a $15 gift certificate from Whimsy Stamps. I shared this stamp image yesterday, but for this card I used black ink for the outline and colored it in using colored pencils for a completely different look. I used the stencil and gold ink from the kit to add some splashy fireworks to the background, and splattered some of the same ink around the wand for even more sparkle and kick. This card was so much fun to make - this is done with the individual smaller stamp elements from the set. I started off with the images in green - I positioned the stamp, inked and stamped, then rotated the panel 90 degrees and stamped again, and repeated that around the panel... since the panel is a square, it stamped in the same position on each side. I repositioned the stamp between my first two impressions, and did another round of stamping to complete the ring. I followed the same process for the star image, and then added the little 'poofs' by hand. So fun! I'll have a couple more ideas with this technique coming up next week. Here's a closer look! Like I mentioned yesterday, I have one $15 gift certificate to give away! For an extra chance to win, please visit the Paper Door info page, then come back and tell me about your favorite feature of these new kits! Make sure I have a way to contact you as well! I will draw and post a winner Monday evening (March 19) at 8:00 Central time! Just looking at everything you get in the kit, it looks like a real bargain. Two more adorable cards. Such a fun card, Dina. My favorite part of the kit it the fairy stamp! My favorite feature is the special edition stamp set. Love all the sparkles in your cards ! About the kit, I like there’s a lot of paper and there’s an ink pad + embellishments each month. That’s great feature. But sadly the international shipping cost is just way too much for me. I’m so sad !! I like that the Paper Door kit is not a subscription! Very pretty, Dina. The fairy is just darling. LIMITED EDITION stencil, die or other fun accessory. Fantastic cards Dina with the amazing Paper Door kit. Love the soft look of the fairy on the first card. The second card is very creative with the circle of fireworks. Love this! NO subscriptions to commit to.